The Archives.com Learning center has recently posted the article Accessing Family Treasures in the National Archives. 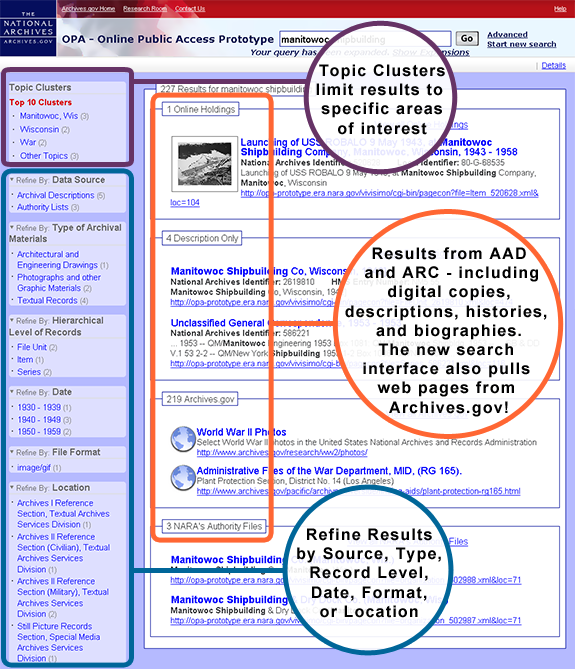 This overview of the new search tool Online Public Access (OPA) - fondly pronounced as "oh-pah" introduces OPA to the genealogical community. 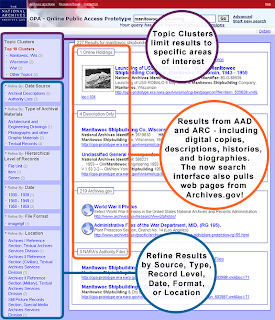 However, other researchers will also benefit from this streamlined approach to searching for resources within the NARA using the inquiry tool provided on the OPA interface. The primer gives an OPA overview and provides some helpful links for ordering documents and files that are of interest to the family researcher: microfilm, textual records, cartographic and architectural records. As you reference Accessing Family Treasures in the National Archives you may find that some of your old NARA website bookmarks need to be updated, but all of the previous information from ARC is still available. And there will be a transitional period where ARC and OPA are running concurrently. January 21 - 1:00 p.m. - Provost Marshal Records, presented by Archivist Jake Ersland - The Provost Marshal General's Bureau was created in 1863 to streamline the process of filling the ranks of the Union Army. This entailed enrolling men for the draft, enlisting volunteers, conducting physical examinations for enlisted men, and arresting deserters. In the process of carrying out these tasks, the Provost Marshal recorded a wealth of information on men eligible for military service during the Civil War. The result is a gold mine for genealogists, who can use the records of Provost Marshal General's Bureau to learn fascinating details about their ancestors and what their lives were like during this crucial time in American history. January 28 - 1:00 p.m. - 68,937 and Counting: Inmate Case Files at U.S. Penitentiary at Leavenworth, KS, presented by Archives Specialist Steve Spence - A treasure of information awaits researchers and genealogists inside the prison records of Leavenworth Penitentiary. More than almost any other federal record, inmate case files offer unsurpassed biographical details on the life of an inmate. This presentation will cover what is available inside inmate case files and how to go about using them for genealogical research. Looking forward to receiving feedback on the Accessing Family Treasures in the National Archives article.